A celebrity surprise at a South Florida wedding over the weekend. Actor and comedian Adam Sandler surprised a couple on Saturday, posing for a photo on their big day. A celebrity surprise at a South Florida wedding over the weekend. Actor and comedian Adam Sandler surprised a couple on Saturday, posing for a photo on their big day. Palm Beach Photography, Inc. posted the picture on Facebook, showing Sandler with Karan and Tatiana Shah at the Pavillion Grille in Boca Raton. 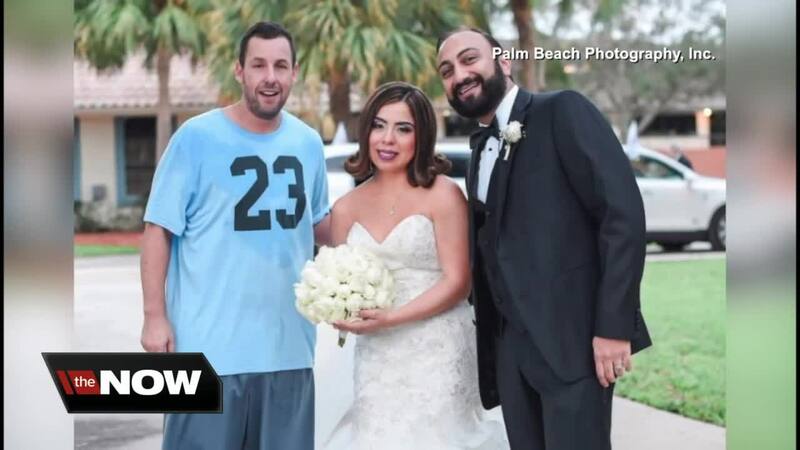 Scripps affiliate WPTV spoke to the Shahs on Monday who said they were taking newlywed photos after their ceremony when they saw Sandler in his car. He had been playing basketball nearby. "There’s a guy reversing out with his window down, and I’m just looking at my beautiful bride, and I look and look and look, and I’m looking at her and... Adam Sandler?" said Karan Shah. "And he’s like, that's me! And I said, ohhhh that's cool!" Shah asked Sandler if he would take a photo with them, which the actor happily agreed to do. He even wished them luck on their journey of marriage. "The guy is so humble and so gentle," said Shah. "If he sees us we just want to say thank you from the bottom of our hearts for just making this wonderful memory for us."